Expert Local Citation Survey | How Important Are Local SEO Citations? Posted in Bright Ideas / Research on September 4, 2016. Welcome to the Expert Citation Survey 2016. This study takes a deep dive into the world of local citations with the help of 21 local search experts who have provided their experience, knowledge, and insights. This is the 3rd time we’ve run the survey, having published previous editions in 2013 & 2015. We asked our local SEO experts 17 questions that would discover how relevant citations are in 2016, how important they are for local businesses, and current best practices for building and cleaning up citations. Huge thanks to the 21 local citation experts for taking the time and effort to give us their insights for this research. You can find the full list of participants below the survey findings and their sage quotes throughout. How important are Accurate Citations to local search ranking? What level of importance do these factors have when selecting which citation sites to use? Which of these sources of unstructured citations do you favour above others? Do you update existing wrong citations or build new citations first? 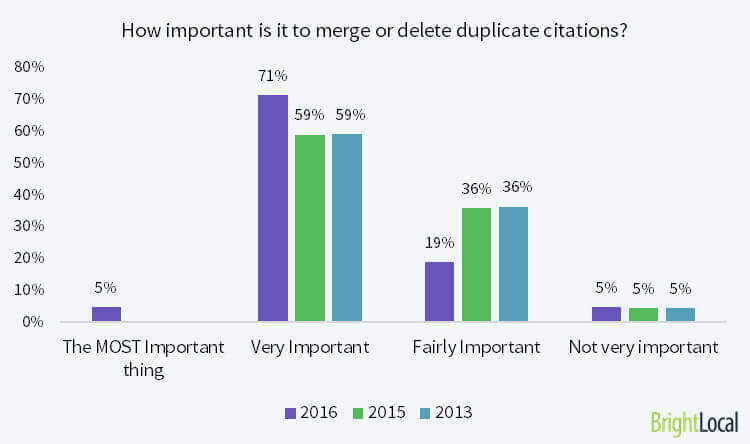 How important is it to merge or delete duplicate citations? Does address formatting need to be 100% perfect or do small differences not matter? How important is ‘richness’ of citations and ensuring listings contain additional data? Aside from NAP details, which additional data is most beneficial to citations? Do you think it’s best to build citations quickly or steadily over time? For a new business vs. pre-existing business, do you fix/build citations at same velocity? For a new business, how many citations do you aim to build within first 1-2 months? 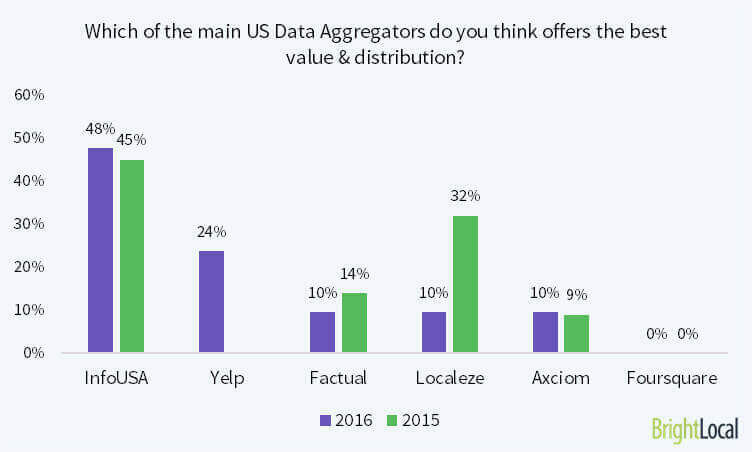 Which of the main US Data Aggregators do you think offers the best value & distribution? Which approach to fixing / building citations yields the fastest results? Which approach to fixing / building citations is most cost-effective? What are the Pros & Cons of using Aggregators to build citations? What are the Pros & Cons of manually building & claiming citations? 90% of the experts say that accurate citations are Critical or Very Important to local search ranking, which is the same as in 2015. However, last year 55% said accurate citations were ‘Critical’ but that figure has fallen to 33% in 2016, indicating that the relative power of citations has lessened while other factors have greater impact. Quick reminder: in the 2015 Local Search Ranking Factors, External Location Signals (which includes citations) made up 13.6% of the overall ranking factors, down from 15.5% in 2014 & 16% in 2013. 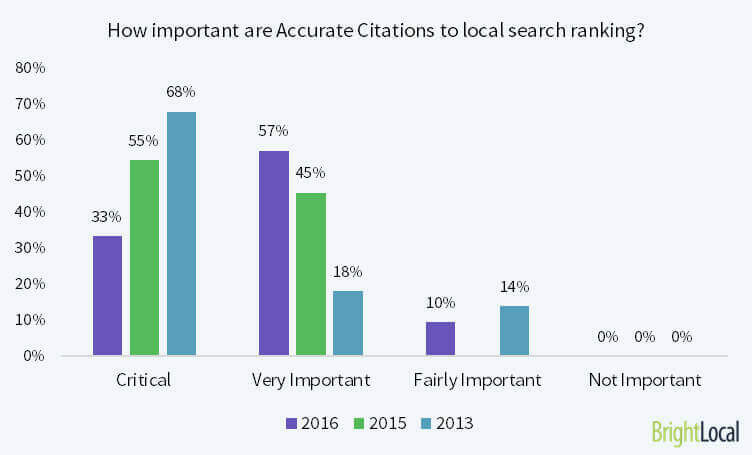 So Citations are still important to local SEO but their impact is waning. 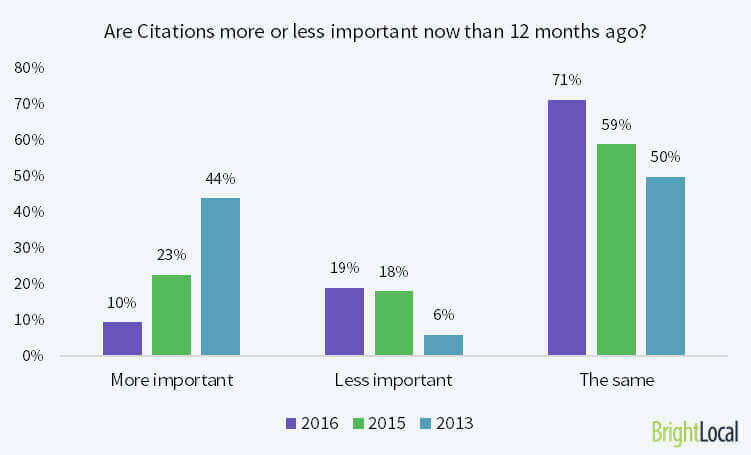 19% of the experts rate citations as less important vs 2015, with only 10% saying their influence has grown year on year. The large majority (71%) say their importance has remained the same. We can see in this study that, since 2013, there has been steady decline in the perceived importance of citations. So why is this? The primary reason is that Google has invested heavily in building up its own local data set to a point where it trusts the quality of its data more and more. When it comes to confirming the data it holds, Google looks to certain authoritative sites such as Yelp and Foursquare, and they pay less and less attention to the data held by smaller, less authoritative sites whose own impact and fortunes are in steep decline. So, whilst citations are still very important, other factors such as traditional rankings factors (e.g. links) now carry more authority in local search. Of course, ranking factors go in cycles. Links were recently confirmed by Andrey Lipattsev Search Quality Senior Strategist at Google), to be one of the top 3 organic rankings signals. But we also know that links themselves have had a very chequered past, so putting all our SEO eggs in one basket is never a good idea. Year on year there’s a big upturn in the importance of quality citations over quantity (+15%), and since 2013, that stat has risen by 22%. By ‘Quality’ we mean the type of sites citations are built on. Quality sites are ones which are more relevant to a business &/or have higher domain authority – see next chart for more detail on this. However it’s worth remembering that quantity is still important in certain scenarios. For example, in competitive markets such as Attorneys or Dentists, a business may have to build a certain number of citations just to have parity with their competitors. So there needs to be a sensible balance, but one with a focus on building citations on high authority sites first. “Citations in local SEO are a lot like links in traditional SEO. Back in the day, everyone just bought a lot of links because they helped rankings. Sheer quantity was more influential than quality. Then Penguin hit and sent the SEO industry reeling. I hope the local SEO industry learns from history and sees that citations are headed in the same direction. It’s only a matter of time before the local algorithm becomes refined enough to penalize businesses with citations that are irrelevant to their vertical.” – Cori Graft, Seer Interactive. “Look at your competitors who are doing the least work with citations and yet getting great results. Try to get the same citations they have because they are doing the least amount of work and getting the best results as opposed to looking at the competitor who has 100’s of citations. I bet the competitor who has fewer has the ‘right’ citations. Remember it’s not the quantity of citations that wins, but the quality of those citations.” – Matthew Hunt, Powered By Search. What level of importance do these factors have when selecting citation sites to use? N.B. We asked the experts to credit each of the above factors with a ‘low’, ‘medium’, ‘high’ or ‘very high’ rating, and created a score based on their responses. ‘Offer Follow Backlink’ is new for 2016, so there is no year on year comparison. Industry Relevance comes out as the most important factor. Industry specific sites are important because they give Google a clear understanding of what product or services a business provides. Because of their industry focus these sites have typically have deeper, more unique content which Google loves and so they rank well for targeted search terms. These 2 things combined means that these sites often deliver more targeted leads for businesses. Similarly, Local Relevance provides Google with valuable insight on your location and areas served. Whilst Industry and Localness are key, it’s also clear that there are a number of other factors to consider when deciding which citation sites you want to be listed on. N.B. ‘Event Sites’ is a new category for 2016 so there is no year on year comparison. A structured citation is a business listing with a clearly defined presentation of business name, address & contact details. On many sites these listings will use ‘structured mark-up’ (e.g. schema.org) to make it easy for search engines to correctly interpret the data. 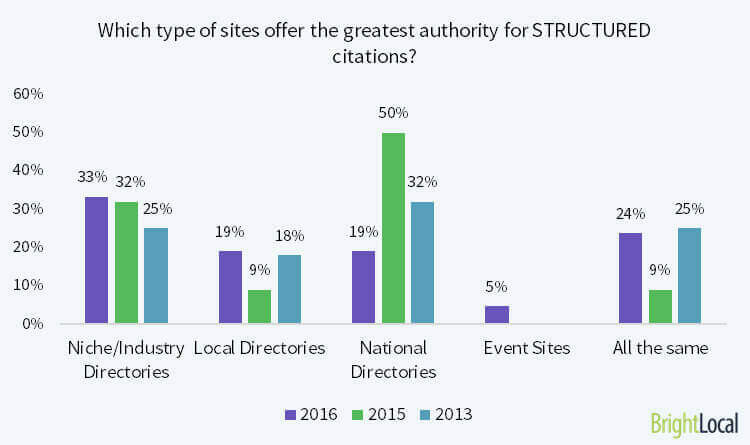 Whilst Niche / Industry Directories offer the greatest authority for structured citations, the rating for Local Directories has jumped up since 2015. At the other end of the scale, the general authority of large, National Directories has declined significantly. As we saw in the previous chart, Industry Relevance & Local Relevance are considered the most important factors, and so these type of sites deliver higher all-round value as citation sites. Unstructured citations typically don’t use a defined presentation of business data & don’t use specific mark-up to present the data. Often they will not be complete listings and display basic or even partial NAP mention. Industry Associations & Local Business Groups come out top of the list. This is because they are comparatively more easy to get a listing on than other sites and they are ‘industry’ relevant which, as we saw above, is very important. The high authority that comes from a listing on a local Government site makes them appealing sources of citations, but their preference among local experts dropped considerably year on year (from 20% to 8%). They do offer valuable listings but the difficulty in securing a listing makes them harder to achieve so many SEOs don’t target these sites. Local experts are split on whether to update existing wrong citations first or to tackle existing & new citations at the same time. However, since 2013 there has been a definite trend towards updating existing citations first. It’s clearly important to clean up any existing data issues as these will hamper your local ranking and limit the impact of building new citations can provide. Doing a full audit of your existing citations before you start is always advised, then you can build new citations safe in the knowledge that you have a strong foundation. Quick plug – using our Citation Tracker tool you can get a full citation & NAP in less than 5 minutes so please try it out! Dealing with duplicate citations is a very important task to tackle and despite the fact it’s often a tricky, time-consuming process, it’s importance has grown year on year. 76% of local experts say it is either Very Important or the MOST Important thing to do. This only reinforces the importance of having a clean data set that doesn’t confuse Google. Most experts agree that address formatting is important but not critical. However there is a growing trend towards this becoming less of an issue (29% vs 14% in 2015). Likewise, only 5% said address formatting must be 100% consistent (vs 18% in 2015). How important is ‘richness’ of citations? When we talk about ‘rich citations’ we refer to listings that contain additional data such as a description, photos, opening hours, payment details etc. 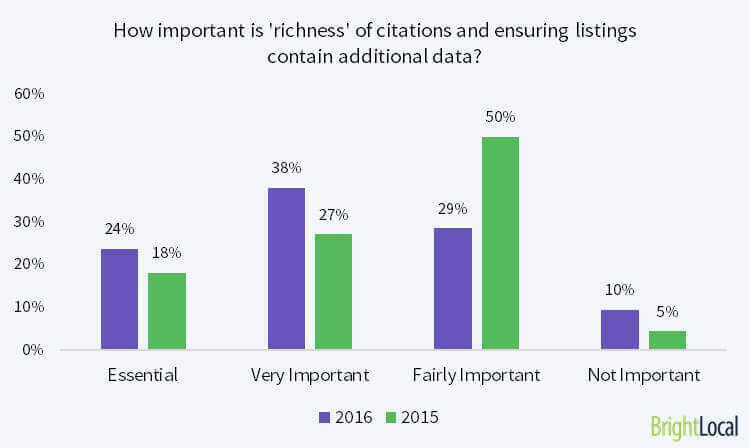 We can see that these type of listings are growing in importance over time, with 24% of experts suggesting that rich citations are ‘Essential’ (vs 18% in 2015) & 38% saying that they are ‘Very Important’ (vs 27% in 2015). A business listing is akin to a landing page for your business where you can inform & pitch to customers before they even reach your website. Therefore an incomplete listing has reduced value and limits your ability to convince a prospective customer to contact you. But if you add photos, a full description, product details & opening hours, you have a better chance of turning browsers into leads. In the following chart we take a look at which additional data is most important to feature. *Experts were asked to select a max of 2 answers. This is a new question for 2016 so there is no year on year comparison. Getting a backlink from a site & choosing the correct category are considered the 2 most important factors, beyond having a correct NAP. Backlink – passes link value through to your site which has obvious benefits to both organic & local rank. Category – this is increasingly important as it informs Google about what your business does. Using an incorrect category can confuse Google’s understanding of your business which can hurt your ability to rank for relevant keywords. There’s a real mix of results here, but the top 2 responses suggest that citations should be built over 3-6 months, and that citation building should be an ongoing process that never ends. 19% of experts say that it depends on your existing quantity of citations. This is important because a new business can build 50 citations right away & see some good impact, but for an existing business, this may not even touch the surface. So each scenario deserves its own strategy. A lot also depends on the level of competition in each industry or location, so it’s useful to benchmark against competitors and then gauge what citation work needs to be done. There is also an increase in those experts who suggest building as many citations as you can right away (19% vs 5% in 2015). For a new business vs. existing business, do you fix/build citations at the same velocity? *This is a new question for 2016, so there is no year on year comparison. 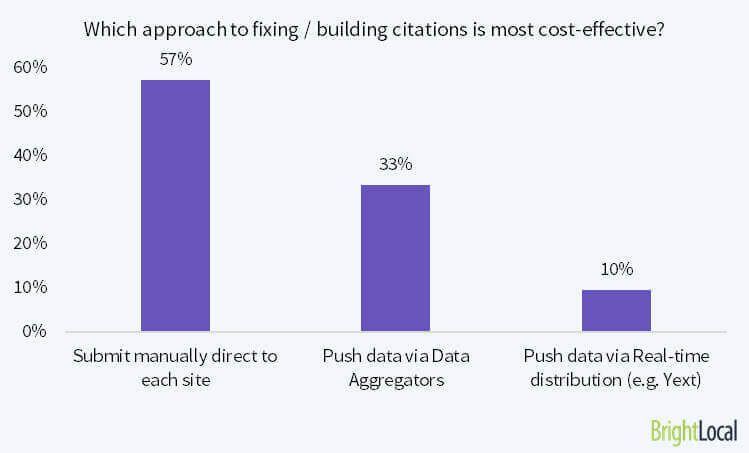 Once again we see that there is some split on the best practice here, although most agree that building citations faster for a new business delivers value for that business quicker. An existing business is likely to already have some listings so many of those top citation sites that you want to get listed on, may already be in place. For a new business, you’re starting from zero, so there’s more building work to do and a nice clean slate to start from! For a new business, how many citations do you aim to build within the first 1-2 months? *N.B. This question is new for 2016 so there is not year on year comparison. 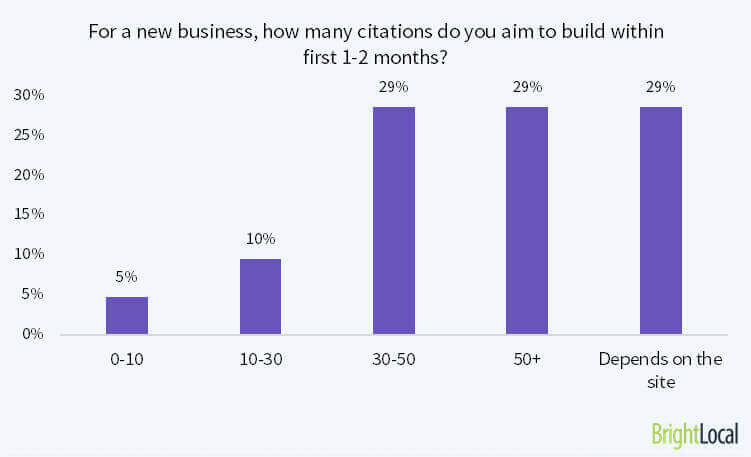 The experts are split on how many citations exactly should be built for a new business, but most agree that at least 30 within the first 2 months is the correct starting point. A new business can tick all the right boxes by getting listed on some of the top citation sites no matter what industry they operate in. Here, we list over 1,000 citation sites for over 41 business categories. Which US Data Aggregators do you think offers the best value & distribution? N.B. At request of some experts we added Yelp as an option to the 2016 survey. InfoUSA is rated by the experts as the Data Aggregator which offers the best value & distribution. Not only does InfoUSA have wide distribution (Google buys data from them), they are also committed to scrubbing data and there is no cost for submission. Yelp is also highly rated, which might surprise many people. As well as being important citation site itself, Yelp has content and review distribution relationships with other services such as Apple Maps and Mapquest. Interestingly, Localeze has dropped significantly year on year (10% vs 32% in 2015). Localeze is the only aggregator which charges a fee ($299-$399) to add listings to their database so maybe this is why it’s less popular. N.B. This question is new to 2016, so no year on year comparison. To be clear, this question refers only to the speed of results. Manual submissions, although very time-consuming, deliver faster results than using data aggregators & real-time networks. This is because many sites will put listings live on the same day or within a matter of days after submission. Compare this to aggregator submissions which can take upward of 4 weeks to result in live listings/updates on 3rd party sites and applications. Further below we list the full Pros and Cons for manual andaggregator submissions. To be clear, this question refers to the cost effectiveness of each process. Submitting manually is more expensive as you end up handling or paying for each listing one by one. So the time/cost is higher. But manual submissions give you a combination of faster results and greater control over your listings. Submitting manually typically allows you to claim a listing so you have control over it forever more which is very important. Real-time distribution is typically the most expensive option. These services have limited distribution networks (because they rely on API connections which many sites don’t have) and they charge recurring fees so you pay every month and year to maintain your data within their network. If you stop paying your data reverts back to its original state – which is often incomplete or entirely missing from a site. “The Aggregator method doesn’t take care of outdated listings on the myriad of sites the Data Aggregators might have distributed data to in the past. The process of the data getting distributed to the end platforms is long – it might take longer than 6 months. And there is no way to control the listings on the end platforms (unless you later claim them manually, of course”.